In Chapter 4 of Because of Winn Dixie, Opal's father, the Preacher, tells her ten things about her mother. She loved finding these things out about a person so close to her that she barely knew. 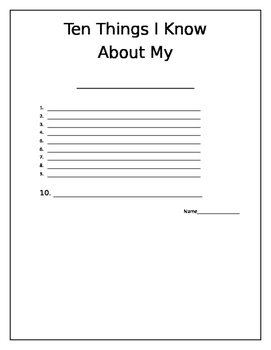 This simple template allows your students to have a home to school connection by choosing their mother, or any other family member (the blank is so the student can easily choose an available family member to complete the project) to ask them ten things about themselves. My students enjoyed this activity very much and decorated their borders very creatively. They were proud to reveal things about their close family members to their classmates.